The skull structure of both snakes and lizards is distinctive. They can move their upper jaw relative to the braincase. They bear horny scales, and many use venom for attack and defense. The Squamates are definitely a monophyletic group; they are a sister group to the Tuatara. Judged by their fossil record, the Squamates were present in the Mesozoic, but occupied a minor place in the land ecology. Three of the six lines are recorded first in the Upper Jurassic, the others in the Cretaceous. Probably all (including snakes) arose earlier in the Jurassic. The Mosasaurs of the Upper Cretaceous were by far the most successful of all the lizards, becoming the top predator in their ecosystem. Although snakes and lizards look so different, neither are proper clades. Snakes did descend from early lizards, so both groups together do form a monophyletic clade, the Squamata. Within that clade there is another monophyletic clade, the Toxicofera. This includes all venomous reptile species, as well as many related non-venomous species. The evidence for this is in recent molecular analyses. Sight is very important for most lizards, both for locating prey and for communication. Many lizards have highly acute color vision. Most lizards rely heavily on body language, using specific postures, gestures and movements to define territory, resolve disputes, and entice mates. Some species of lizard also utilize bright colors, such as the iridescent patches on the belly of Sceloporus. These colors would be highly visible to predators, so are often hidden on the underside or between scales and only revealed when necessary. The dewlap is a brightly colored patch of skin on the throat, usually hidden between scales. 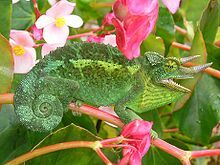 When a display is needed, the lizards erect the hyoid bone of their throat, resulting in a large vertical flap of brightly colored skin beneath the head which can be then used for communication. ↑ Capula, Massimo; Behler 1989. Simon & Schuster's guide to reptiles and amphibians of the world. New York: Simon & Schuster. ISBN 0-671-69098-1. ↑ 3.0 3.1 Benton, Michael 1997. Vertebrate palaeontology. Chapman & Hall, London. ↑ Fry B. et al. 2006. "Early evolution of the venom system in lizards and snakes" (PDF). Nature 439 (7076): 584–588. doi:10.1038/nature04328. PMID 16292255. http://www.nature.com/nature/journal/v439/n7076/abs/nature04328.html. This page was last changed on 10 October 2018, at 08:58.